This weekend I spent over 18 hours in the hospital. In my childhood, hospitals were always considered a place to be feared. My first memory of being at one was after a school bus accident. All I can recall of the incident is being in a big, cold, white room filled with other frightened elementary school-aged kids as we waited for our families to come get us. Being there felt isolating. Busy bodies hurried by in white coats and blue scrubs, unsmiling and serious about the tasks at hand. The hospital was not a place I ever wanted to see again after that day, but ironically it is now the place I thrive in within my career. I am still very aware that many do not have the same level of comfort in this setting as I currently do. Just this Sunday as I was doing my hospital rounds, in one of the first rooms I visited sat a fear-filled patient whose apprehension about her upcoming surgery was tangible. She lay in her bed with tears brimming her eyes and hands trembling. “No family”, she later told me, as her husband had died years earlier and they did not have any children. So not only did she feel isolated within the physical building, she also felt isolated within her personal life. Fear will always want you to think you are alone. It grows and feeds on these feelings. Often it will cause you to be ashamed to even acknowledge its presence. Overcoming fear requires confronting those feeling directly and inviting in the support of others. 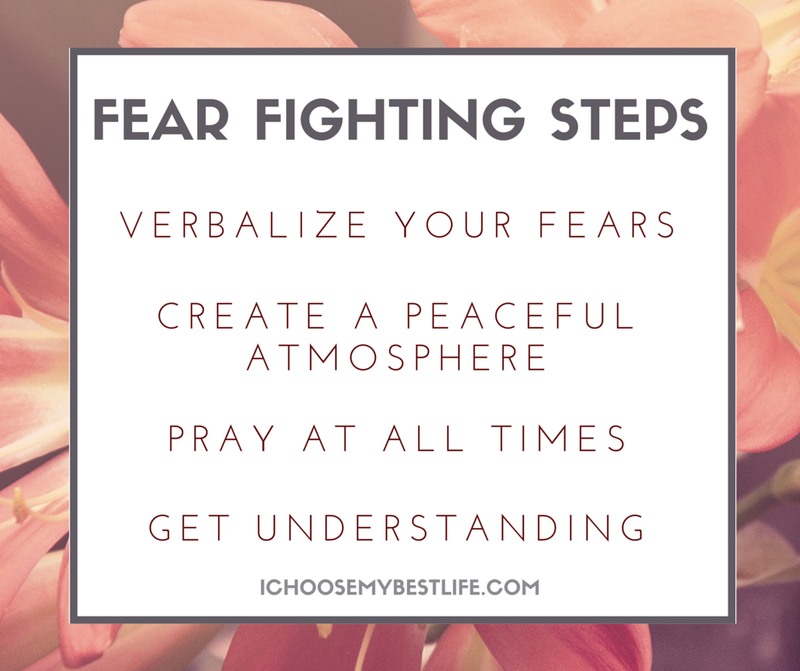 The next time you find yourself or a loved one in the hospital, come fully equipped to walk your healthcare journey in peace with these fear fighting steps. Verbalize Your Fears — I was very encouraged by the patient mentioned above. While it was obvious she was very anxious, she refused to allow her anxiety to prevent her from reaching out for help. She courageously told me about her fears. This opened the door for me to not only educate her about the procedure she was scheduled to have, but to also encourage her and pray for her. Most doctors and nurses of faith are looking for ways to be used by God within their workplace. When you verbalize your anxieties it allows your healthcare team to better serve you both physically and emotionally. Create a Peaceful Atmosphere — The ICU is one of the most anxiety producing floors within any hospital. When life and death hang in the balance, fear lingers in the unknown. God is omnipresent. Regardless of the location, His presence is able to come in and change the atmosphere. I have witnessed it on many occasions. One tool used in our ICU is calming music, preferably Christian worship music. Worship is a powerful fear fighting weapon. I love when I walk into the room of a sick patient and hear the melody to “There’s power in the name of Jesus to break every chain.” Change begins with what you hear and believe. Pray At All Times — There is a saying that goes, ‘sometimes prayer changes things and sometimes prayer changes you.’ Regardless of the flow of change, the reality of the effectiveness of prayer is a fact. Ask your surgeons if they will join you in prayer before any surgeries. Ask your nurses to hold your hand when you pray before a new cancer medication is given. Pray when you are afraid and keep praying even when all is well. Prayer builds a wall around your spirit that makes it hard for fear and anxiety to stick to you. Get Understanding — The reality is healthcare today is very different than it was 10 years ago. Gone are the days when you have the same doctor for life who sees you both in the hospital and in their private office. As the use of hospitals continue to grow, most patients will see a new medical team upon admission to the hospital. Just because the doctor treating you may not be your regular physician, it does not mean they do not have time for you. If you have questions or concerns, ask your treating physician and healthcare team. Keep asking questions until you have a good understanding of your diagnosis and treatment plan. We cannot eliminate all of the unknowns of healthcare, but even removing a few will greatly decrease your anxieties and fears. If you know someone who is being admitted to the hospital, a few great gifts are CDs of worship music with a small CD player, an iPod fully loaded with Christian praise, or a devotional book. Of course, your presence and prayers are the best gifts of all.